The Boeing 727 is a medium-size, T-tailed commercial jet airliner with a narrow body and 3 engines. The first Boeing 727 started operation in 1963 and for over 10 years it was the most manufactured commercial jet airliner in the world. Initial design research began in 1956, It introduced a sophisticated wing design by being the 1st airliner application of triple slotted Krueger flaps.. It was also the first Boeing airliner to have an APU (auxiliary power unit). The prototype version first flew on February 9 1963, with certification approved in December also in that year. The first Boeing 727 started operation with Eastern Airlines on February 9 of 1964. 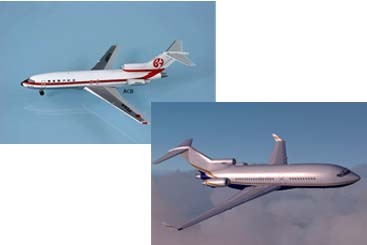 Its variants are 727-100 and 727-200.